It felt as though I was in a strange dream as I drove into the town where I’d spent the first eighteen years of my life. A feeling of surreal nostalgia swept over me the further we drove into the small, coastal town of Eden, the place where I’d grown up. Everything was different, yet still the same. Overwhelmed with memories, I stared out the window as we passed important landmarks, such as the country club I used to help my dad clean in the early hours of the morning before school, the same country club where I first learnt to pour a beer. We drove past the turn-off to my old neighbourhood, where I used to spend my days playing at the lake, or riding scooters around the block with my childhood friends. We drove past the vet where my old cat Bamels was put to sleep, the first pet I’d ever known. Located on the Far South Coast of N.S.W, Eden is the last town on the water before the Victorian border. I lived there for most of my life, before moving away after high-school to live, study and work in Wollongong, N.S.W. Anyone who has grown up in a small town will be the first to say that their town is a dead end; a place they can’t wait to leave. I was one of them. Don’t get me wrong, I’ve always loved Eden, but there was a whole world out there waiting for me to explore; I figured I was escaping the small-town trap that can capture you, and I was determined to ‘get out’ and go live my life, and I never looked back. Since I left Eden all those years ago, both my parents have also moved away; my dad left in 2012 to live closer to my grandparents on the Central Coast, and my mum left in 2013 to live in Canberra. I no longer had any roots to my hometown, and this became painfully obvious when I recently returned to the great town of Eden for the first time in almost three years; I felt for the first time like I was a stranger to the place where I had spent over half my life. After I finally accepted the idea that it was possible to no longer felt like a local in my hometown, I realised that I could now see Eden through the eyes of a traveller. For someone visiting Eden for the first time, the natural beauty of the place is what’ll initially catch your eye. 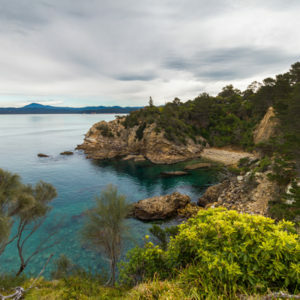 The rugged coastal landscape hugs the tiny town, from the deep harbour to the lookout, to the long, sandy beaches, to the outskirts of the huge Twofold Bay surrounding it all. A natural paradise like no other, Eden is a place rich with history, colourful characters, natural beauty, and to put it simply, a traveller’s dream come true. One thing I’ve always loved about Eden is its whaling history. 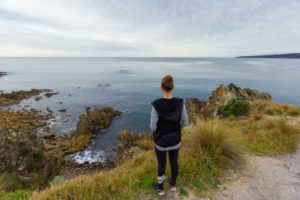 Growing up, we were surrounded by whales; our local AFL team was (and still is) the Eden Whalers, the local soccer club named aptly named the Killer Whales, and every year the town hosted the Eden Whale Festival – a weekend of celebrating Eden’s history. 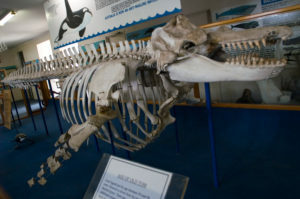 There’s also the Eden Killer Whale Museum, within which the skeleton of ‘Old Tom’ resides. Old Tom’s story is one I tell everyone who asks me where I’m originally from. He was a killer whale who lived in Twofold Bay, and his pod would often help the local whalers in Eden by herding other whales into the shallow waters of the bay, or alerting the whalers at the now heritage-listed Davidson Whaling Station to the presence of whales by slapping their tails on the surface of the water. Waiting for the whalers to join them in their tiny row boats, the killer whales would then lead them to the right spot. Old Tom and his pod of killer whales would then attack the other whales, attempting to cover their blowholes so they could no longer breathe. As a reward for helping the whalers subdue their prey, the killers were given the lips and tongues of the dead whales – an incredible relationship between man and creature. Old Tom’s body was found floating in Twofold Bay in 1930, and his memory was forever preserved in the Eden Killer Whale Museum – a place you should check out if you ever visit the great town. Today, whaling in Eden is nothing but a historic memory. Learn more about Eden’s whaling history here. The first port of call on my journey through my hometown as a traveller was the Great Southern Inn, or as the locals put it, the Top Pub. Walking in with my boyfriend Scott and my mum Jo by my side, I was instantly taken back to memories I’d stored in the very back of my mind. Weddings, sporting presentations, birthday celebrations and countless other events I’d attended at the Top Pub in the past came back to me in a wave of nostalgia, and I couldn’t help but smile. Though the décor, layout and some of the faces had changed, I knew deep down that it was the same old pub where I’d made so many memories. Plus, lunch in the restaurant, Essentially Eden, is absolutely delicious, and I’d recommend popping in for a feed if you’re in town! The harbour was next on the list. After grabbing a coffee, we strolled up and down the wharves, watching the local fisherman unloading their boats, full of fish that would eventually make their way to the markets in Sydney and Melbourne. We saw a few familiar faces as we roamed around, admiring the view of Snug Cove from our seat on the edge of the wharf above the third-deepest natural harbour in the Southern Hemisphere. When I lived in Eden, I always thought it was so vast, and it took forever to get from one side to another. Coming back after almost 9 years living in a city the size of Wollongong, I realised that Eden is actually much smaller than I remembered. Walking from my old house to the main street used to feel like forever, but now it seemed like nothing. 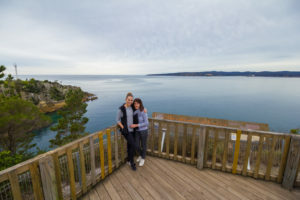 We drove up to the Rotary Park Lookout to take in some of the incredible coastal views that Eden has to offer, as well as go past the first house I remember living in. It was here that I started to really feel sentimental about my return to the great town, and I knew that I’d taken my years living here for granted. As we wandered through the cliff-side forest that used to serve as my childhood playground, I wished I’d spent more time exploring my hometown when I lived there, rather than wishing I was somewhere else. Scott had visited Eden with me before my mum had moved away, and has always loved exploring the coastline. He often encouraged me to take a road trip down the coast, stopping in and exploring the towns along the way, before ending up in Eden. ‘Why would I want to do that?’ I’d reply. ‘I lived there my whole life and did that drive all the time!’ Only now I realise how silly it was for me to assume that just because I’d lived somewhere my whole life, it wasn’t worth returning to. Scott’s love of my hometown and his eager desire to explore it has made me realise how lucky I have been to grow up in such a beautiful place, and how much I’d missed it. A weekend certainly wasn’t enough time to reacquaint myself with Eden, but we’ve already made plans to return in the summer, and take that road trip I’ve been denying for so long. Until next time, Eden. You were, and always have been, simply wonderful. Despite the number of years that continue to pass, and the fact I no longer have a house to call home, you’ll always be the place where I grew up. You’ll always be my hometown. It will always be home Courtney,no matter how far away ,or for how long you are away,will always a part of you in your heart,am enjoying reading your travell stories & look forward to new exciting ones,love Mimmi. 2551 represent! Great read court, as always! Great read Court. You’ve made me a little home sick. Beautiful courtney , everytime i visit eden i get a bit homesick .i left there 19 years ago now , eden always has a special place in my heart . Eden in is such a special place where the character of the people match the sheer beauty of the surrounds. Many great memories and well captured Court. Great read! The Garden of Eden looks fab. Eden is also my home town and I also left there when I was 17. I still have some family and friends there that I go back to visit now and then and on special occasions. I too, took Eden for granted and never really appreciated it’s true beauty until I returned as a tourist.. So too speak. I have heaps of great memories made at the old top pup and the bottom pub. I remember having a school class lesson in one of the rooms upstairs, at the arcade where the laundromat is. I was one of the first pupils to attend the Eden high school. I used to work at the fish cannery down there and 41 yrs later I am still using my old cannery knife in my kitchen on a daily basis. I will never get rid of it. Lol. I have to admit that 5 or so yrs ago it finally broke so I got my son to pot rivet it back together for me. That knife holds a lot of precious memories for me at the cannery. You could imagine how I felt when I returned home to find the cannery had been demolished. I was devestated. Just about everyone in Eden worked at the cannery or out in the bush, logging for the chip mill. It was Edens bread and butter, so to speak. The town would of become a bit of a ghost town since then. I was back down there last yr for sisters wedding. I always love going home when I can. Myself and my brothers were all born and raised Edenites. There is no other place that I can go and feel completely at ease. I havent lived at home for many years now but Eden will always be home. I love going home to visit family and friends. I have some of the best childhood memories and all of them were in Eden. Feeling very homesick after reading this, but I loved it! I’m planning a return trip in the summer to catch up with my old crew…its been too long. I left Eden 15 years ago but still refer too it as “home” if asked what are you doing for christmas if Im heading to Eden, still to this day i say..”going home” . I too now know the feeling of not having a home address in Eden but still get the very same feeling every time i come round quarantine bend into eden..”im home”. It holds a million cherished memories for me. the town, its people and everything about it is what made me the person i am today…Your blog has made me very homesick! Very well written.